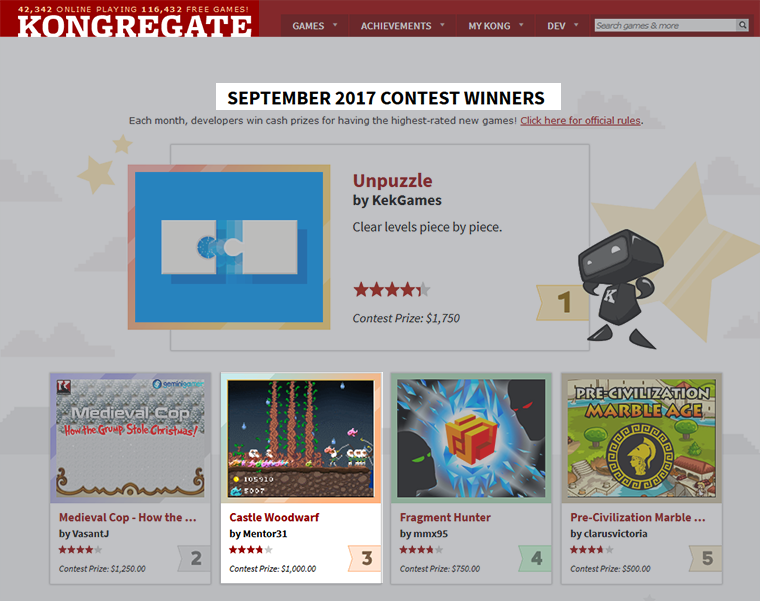 Thrilled to see Woodwarf won 3rd place in Kongregate September 2017 Contest! Currently it has got 3.89 rating, which fell from 3.95 during the last ten days. It probably went down because of the lag many people got on Kong but it was still enough to anchor us in 3rd position. Mobile games got some attention after all and currently there are around 6k of downloads combining both stores. Still, there are so many uninstalls and ads revenue is not that great at the moment. For me, this is such a nice success story and I am grateful to all that helped and followed this game on its journey! In Woodwarf 2 I will put much more focus on the gameplay itself and I am already eager to see how it will turn out. Still a great result. Congrats. Well deserved. Congratulations! Third place is still pretty impressive. Imagine all the games that are submitted in a month. Thanks, guys! I think many of submissions were created in just a few weeks or so by single devs. Woodwarf has been made for around 4 months and I had help from Armor Games testing and suggestions. Plus our team has 4 people - Greg for music, voices and effects and everything else, Theo for part of the art, Ceosol for programming optimization and me. Plus we hired a YouTuber Chelsey for girls voices. So we have some advantage compared to many submissions and I think we can be proud on the accomplishment. Good work to you and the team! A few months ago I discovered Piskel. It is an excellent free sprite creator, there are both online and desktop apps. My animation workflow got much faster since using it, so I decided to correct the chopping a bit like iii suggested. Here are some nice statistics - applyzer is saying Castle Woodwarf is top 100 strategy games in four countries. 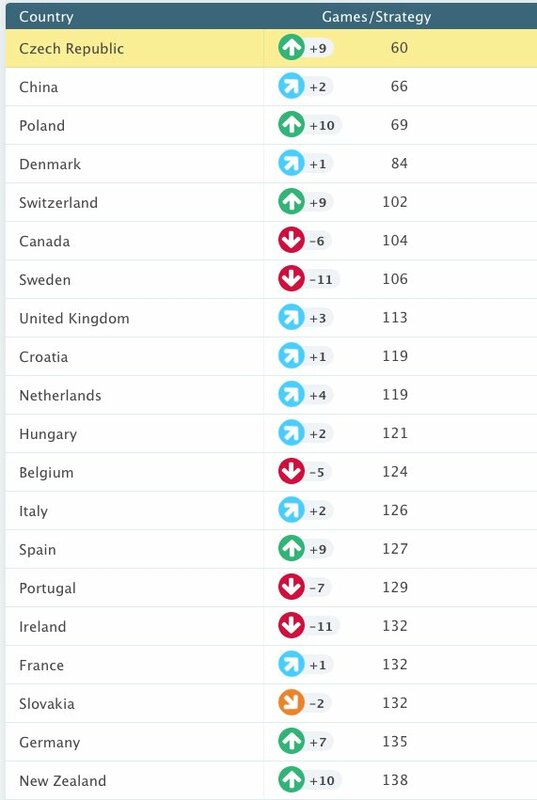 I especially like the fact we are 66th place strategy app in China!! Mobile downloads continue with around 1.7k new daily units. The mobile ads revenue also improved, especially after we fixed what I missed at AdMob settings. Even though ads were showing, we didn't get any revenue until we properly linked the app and I confirmed my payment information. It was a mistake that probably cost us several dozens USD. Currently we earned more than $50 mobile ads revenue. With AdMob properly set up, I think we might keep receiving something between $20 and $30 daily as long as people continue playing. Combining all previous earnings from Armor sponsorship, Kong's prize and Kong's ads revenue the game earned more than $2.200 by today. Congratulations! What a success! I thoroughly enjoyed your game so this is much deserved. It's also nice you posted your sales figures. Whatcha gonna buy? Also, any tips for admob? I was going to use admob for banner ads and chartboost for video ads but if you have any advice or can shed some knowledge that'd be great! It will mostly go for necessities like food and clothes for me and dog stuff for my beagle. As for the ads, Ceosol takes care for that stuff. I am way too clumsy with these things. We still need some time to see what ads bring good revenue I guess. AdMob is pretty easy to set up actually. It was just that in all the rush and hard work around launching, I didn't pay attention to what companies we had so I didn't link it or confirmed my payment info. Currently we use adbuddiz, vungle, inmobi and admob. There are interstitial ads that jump out after each game over or reset of the game. And of course the famous 'watch video to get gems' reward ad. I read how Colin likes to avoid banner ads because they are always there on the screen taking up the space and being all ugly and such. Interstitials don't go in the way so much. When they are gone, player can immerse in the game in peace without any ads around. I like that way of thinking and I used the same principle in Woodwarf. I would suggest using the FGL Enhance extension. I have a quick guide in that forum topic. You can easily set up Chartboost, Admob and 30 other ad agencies all from one source. That's amazing! Also you're making a sequel? Domo would have a better answer for most of that. - Domo did cross-promotion within the app. There is a button in the flash versions to open up the mobile website. I sent mails to Armor, Kong and Newgrounds. They all said they liked the game, but Kong and NG said they no longer have sponsorship programs. I think it is most important to send them the mail once the game is like at least 90% finished, beta ested and polished as much as possible. If Armor didn't offer sponsorship, I would have launch to Kong exclusively the other day. Luckily, Armor got us first and suggested the very much needed improvements. The difficulty I set was way too hard and there was no proper score counting. So we worked on the game for a few weeks more and improved it further. In the pitch mail I also enclosed a few screenshots and links to bigger GIFs of the gameplay, described the features of the game etc. Like Ceosol said, no publishers or marketing, except for the cross promotion from Flash to mobile with "get more gems" buttons. I did invest $24 on FB marketing but it really doesn't give good results because of such low budget (I was already warned about this once, but could not resist, they have such nice analytics haha). Yes! Hope to create it by the Summer 2018 or even earlier if possible. It should be the same concept, but with better graphics (I hope!!!! ), more content and more complex economy and fighting system.